Big Sky may not share the glory of the glitzy resort towns in Colorado and Utah, but with more snow and open space, this undersung skiing nirvana can rest on its own laurels. From the top of 11,166-foot Lone Peak Mountain, there's nothing below you but wide-open slopes and powder bowls with sweeping views across Montana and Wyoming. Between the town's two ski resorts -- Big Sky and Moonlight Basin -- there are three mountains used by an average of only 2,500 skiers per day ... it works out to 2 acres per skier. That means long, floating runs and nonexistent lift lines. Low humidity and moderate temperatures give Big Sky its characteristic "cold smoke" powder (it's also the name of a local microbrew). On top of that, the area gets dumped with 400 inches of this light, fluffy stuff annually. Compare that with 350 in Park City, 309 in Telluride, and 300 in Aspen. Mammoth Mountain in Southern California gets as much snow, but with three times the crowds. Cowboy boots, horseshoes over doorways, antler coatracks, and drinks with names like Moose Drool and Range Rider Red Big Sky's restaurants don't let you forget you're in cowboy country. Dig into T-bones the size of a Stetson at the Corral Bar & Steakhouse, a 1946 log restaurant with wagon-wheel chandeliers. Another favorite is Buck's T-4 Lodge and Restaurant, with its stone fireplace, smoked-trout appetizers, pan-seared deer sirloin, and yes, more wagon-wheel chandeliers. Ski vacation or wilderness trip? Here you get both. To see the wild side of the Gallatin Valley, saddle up with Jake's Horses to clop along the Gallatin River. The bears are hibernating, but keep an eye out for bighorn sheep, coyotes, eagles, moose, and elk that migrate from Yellowstone National Park to warm up at the lower elevation. Sure, you could stay at a slopeside condo, but there are places with more Montana flair. The 320 Guest Ranch, 12 miles outside of Big Sky, has cozy log cabins along the Gallatin River. After a dinner of local beef, elk tenderloin, or cornmeal-crusted trout, head out on a sleigh pulled by hearty draft horses. Burrow under blankets and listen to the wrangler's ranch tales, while you cruise through the forest and enjoy hot cider and chili. Big Sky is 56 miles south of Bozeman airport. Nonstop flights to BZN are available from Denver, Salt Lake City, and Seattle. Big Sky Resort (full-day ski pass $79; bigskyresort.com) is at 1 Lone Mountain Trail; Moonlight Basin (ski season opens Dec 12; full-day pass from $55; moonlightbasin.com) is at 1020 State 64. For riverside cabins, try the 320 Guest Ranch (from $79, including breakfast; restaurant $$$; 320ranch.com), just outside Big Sky. 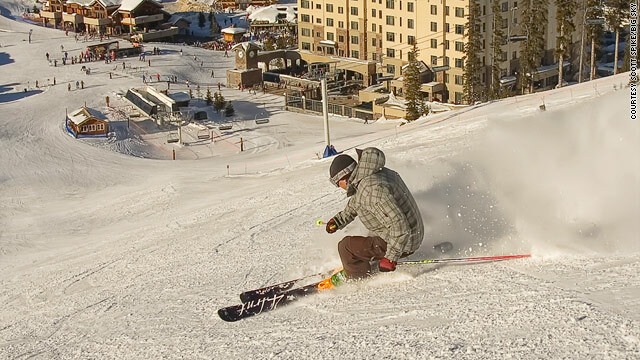 At Big Sky Resort, check into the ski-in, ski-out Powder Ridge Cabins (from $485) or the Huntley Lodge (from $168). For a great steak dinner, head to the Corral Bar & Steakhouse ($$; closed Dec 4; 42895 Gallatin Rd., Gallatin Gateway; 406/995-4249). Rent equipment at Lone Mountain Sports (from $27 per day; at Big Sky Resort; lonemountainsports.net), and ski Flat Iron, Andesite, and Lone Peak Mountains. For lunch, order barbecue pork sandwiches at Pinnacle Restaurant ($$; opens Dec 15; 406/993-5800), at the top of Andesite. Later, saddle up at Jake's Horses (from $37 per hour; reservations required; 200 Beaver Creek Rd., Gallatin Gateway; jakeshorses.com). At Buck's T-4 Lodge and Restaurant ($$$; 46625 Gallatin Rd., Gallatin Gateway; 406/995-4111), try the red deer. Grab the new Biggest Skiing in America Pass ($94; available Dec 12; biggestskiinginamerica.com), so you can ski both resorts. From Big Sky Resort's Liberty Bowl, ski to the Lodge at Moonlight Basin for chicken quesadillas at the Timbers Restaurant ($$; 406/995-7777). Back at the 320 Guest Ranch, take the hourlong sleigh ride ($32; 800/243-0320), also available to nonguests. Sunset - Get Your Weekly Guide to Sunset - food, homes and travel. Sign up for our e-mail newsletter. Copyright 2004-2011 Sunset magazine. All rights reserved.